Comments are now open on this post – a new commenting system has been added. People can post by giving an email address and a name, or logging in with an existing Twitter, Disqus, or OpenID account. This interactive map uses Tableau Public software for graphic visualizations of the data. The map may take a few seconds to load on your computer. The map can be filtered by area and by grade type. If you hover your mouse over a particular circle, it will give more information on that particular school. The color shows how full the school is, with red being more full and blue being less full. 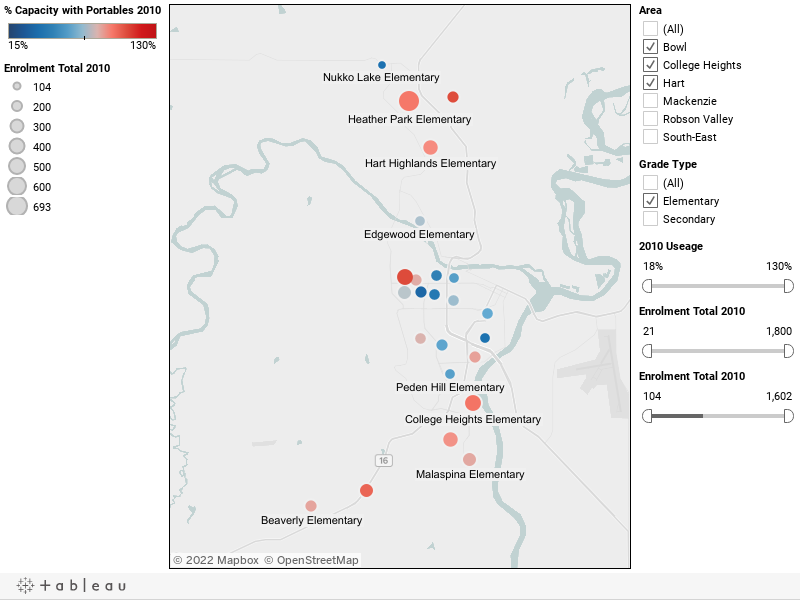 Schools turn red when 80% full or higher. The size of the circle shows the total of the enrollment. 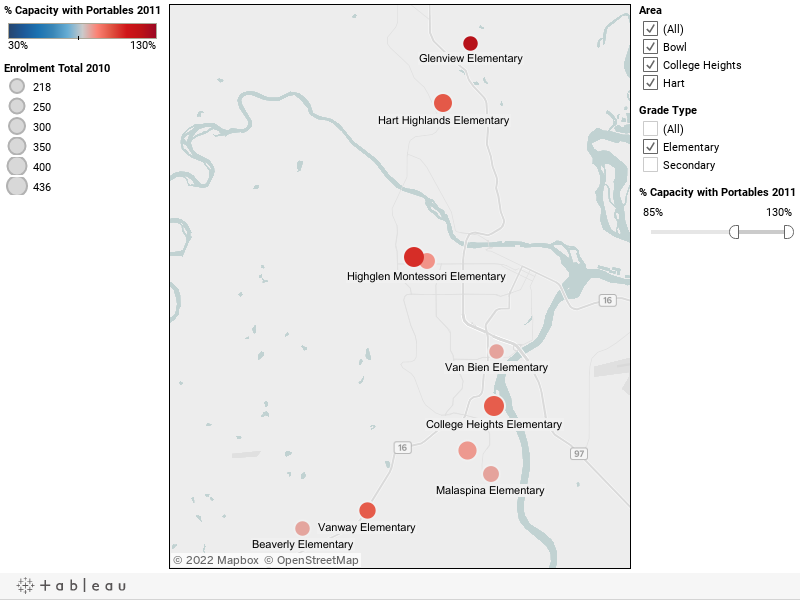 The data can be filtered by area (Bowl, Hart, College Heights, South East, Robson Valley, Mackenzie), by grade type (elementary and secondary), by the percentage of the capacity used in 2010, and by the 2010 enrollment. Enrollment data from Minstry of Education website, data as of September 30, 2010. Working capacity from DSC report, plus allowance of 30 students per portable. Working capacity for Heather Park Elementary taken from current school plan and maximum students possible with current layout. Projected enrollment for 2011 for K-7 schools is projected by taking K-6 classes and assuming they all stay in the school. The kindergarten registration is the average of the current K, 1, and 2 class sizes. Projected enrollment for secondary schools is projected by taking 8-11 classes, and assuming grade 7 to be the average of the current 7, 8, and 9 classes. Projected enrollment for Spruceland assumes that all of Central Fort George transfers to Spruceland in 2011. In addition, choice programs and choice schools may also have enrollment capacity problems. If you have any difficulty on the day of the session, please email info@sd57dpac.ca for assistance. Hello from the Pac 911 workshop! At its public meeting on October 26, 2010, the Board of Education reviewed proposed changes to this policy and approved a motion to distribute them to reference groups for input. Click here to see the draft policy and information about providing input. The deadline for providing input is January 6, 2011. December 1: The school district has posted a FAQ on their website about the proposed revisions, the Board’s process, and the error they made in implementing changes to the policy in 2008: Click here for more information. This will be discussed at the next DPAC meeting, but in brief, this policy governs how catchment applies to schools for kindergarten registration and student transfers. This policy sets the criteria for how priority is given to students when there is no room in a school, class, or program for a student attempting to register or transfer. Note that the catchment for the English program at dual track is the neighborhood, while the catchment for French, hockey, or Montessori (as choice program examples) is district-wide. “Students who are already registered in a district school who wish to attend a different school are required to apply for a transfer through the transfer process. 6.4.1 The siblings of a student who, in the previous school year, attended the school in question and who will be attending the school in the following year. 6.4.3 A non-school district child. “5.1 Each school with the exception of choice schools and programs, distance education, continuing education, district alternative programs and provincial resource programs, will have a designated catchment area. A school with multiple programs will have catchment area for its neighbourhood program. Note that the policy does not seem to have any provision to students registering in a choice program from out of district, or give any priority to a student transferring to their catchment school from a non-catchment school. Additionally, no priority is given to students registering in a program who have siblings already at the school. Also, the policy states: “Students, including those in Kindergarten, are entitled to attend the school serving the geographical catchment area in which they live, except as limited by available space“. There does not seem to be a policy for what happens if a student cannot attend their catchment school because of lack of space. 9. Adjournment – Next meeting is scheduled for Monday, January 10, 2010 at 7:00 pm Van Bien Training and Development Centre.